← Mothering Sunday, a Visit to Lacock and a delicious Veggie Korma! Inspired by the yummy orange and almond cake that I had at the Holburne Museum Garden Cafe last week, I thought I’d attempt to bake an orange and almond cake myself. Look, it’s even cake shape (unlike last week’s brownie gloop which I had to turn into a chocolate ‘pudding’). 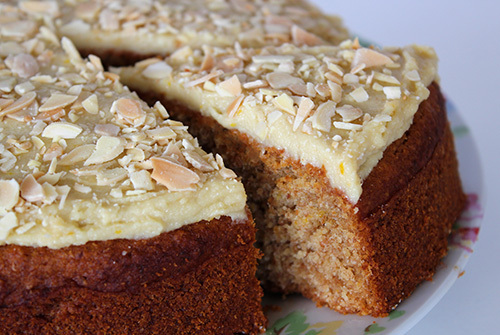 This cake is beautifully moist and has the most delicious almond flavour with a hint of orange. AND, it’s got lots of lovely goodness in it, including B vitamins, vitamin C, vitamin E and a few minerals to boot. The cake’s also low GI, so it gives us slow release energy rather than those horrible refined sugar energy spikes. M and Lil’ L absolutely loved it. In fact, Lil’ L said it was one of the best cakes in the world! For this reason alone, I think this cake deserves its own blog post. So here it is. Unlike regular cakes which are full of ’empty’ calories, this cake is packed full of vitamins, minerals, antioxidants, protein and fibre. It also provides slow release energy thanks to the wholegrain flour and almonds. I would class this cake as a healthier ‘eat any time’ kind of cake, though some of my readers have served it at parties and told me that it went down a treat. It can easily be prepared in advance. In fact, we find it tastes even better a day or two after baking. 1 Preheat the oven to 180C (160 fan) / 350F. Grease the sides of a 20cm / 8 inch loose-bottomed cake tin with oil and line the bottom with non-stick baking paper. 2 Sift the flours, baking powder, bicarbonate of soda and salt into a large bowl. Tip any remaining wheat germ into the bowl. Add the ground almonds and stir through to combine. 3 In a separate bowl, use a fork to whisk together the oil, milk, syrup, orange zest, orange juice, orange extract and almond extract until fully combined. 4 Make a well in the dry ingredients, pour in the wet ingredients and stir to combine (but do not over mix). Pour the batter into the prepared tin. 5 Bake for 45 minutes, or until the cake is lightly browned and springs back when lightly pressed. Leave the cake to cool in its tin until completely cooled (it will firm up as it cools). 6 Decorate with frosting or apricot fruit spread and sprinkle toasted flaked almonds on top. Lightly press down on the almonds so that they stick. Chill in the refrigerator before serving. 7 Stored in an airtight container in the refrigerator, this cake will keep for up to 5 days. It also freezes well. 1 To soften the cashews, boil them in a pan of water for 15 minutes or soak in freshly boiled water for 30 minutes. Rinse in cold water and thoroughly drain. 2 Place the cashews in a food processor along with the syrup, zest, orange juice, orange extract and vanilla extract. Process until the cashews are ground into a creamy mixture. Stop now and then to scrape down the bowl. Add the melted coconut oil and continue blending for a few minutes until the mixture is completely smooth. Taste test for smoothness. Have a wonderful weekend everyone! I hope the sun shines wherever you are! Just wanted to let you know I loved this recipe – I replaced one cup flour with 1.5 cups almond meal and it worked out really well too. It’s now on my list of favourites! My mixture was crumbly and not like a normal batter mixture. I used 2 cups of coconut flour instead of your requirement. Hi Michele. Unfortunately coconut flour won’t work in this recipe as a replacement for the wheat flour, as the only binder is the gluten. Without a replacement binder, the cake would definitely crumble. Sorry! This recipe turned out looking exactly like the picture as I followed the recipe flawlessly, but the taste wasn’t as I had expected! The orange is a little bitter so I would suggest an option to add more sugar or sweetener for those with a sweet tooth like me. Or perhaps the addition of a sweet sugary glaze infused with orange would be perfect. It could also be amped up with the addition of more orange juice perhaps or an orange essence. Overall I think this cake is perfect for those who prefer subtle flavours and treats that aren’t too sweet. Thanks for sharing. Thanks for your feedback Caitlin. I really appreciate it! Yes, this cake is definitely not the sweet/sugary kind. To me, it’s more of a wholefood/every day kind of cake, though some of my readers have also loved it as a birthday/celebration cake. I love topping this cake with orange cashew cream frosting (which is in the linked post), but a simple orange sugar frosting (made with vegan butter, orange extract, orange zest, icing/powdered sugar) also works. The latter would definitely be most appealing if you have a sweet tooth! Anyway, I’m about to have a go at this. Looks delicious! Great recipe. I made quite a few variations but it turned out great. I wanted to make orange choice chip muffins for my kids and I had slightly wet ground almonds left over from making almond milk. I used white flour and white sugar, left out the essences, increased the orange juice and milk slightly (to make up for not using liquid sweeteners) and added chocolate chips and a touch of orange food colouring. They turned out perfectly and have risen up beautifully. I made this cake yesterday substituting half Doves gluten free plain flour and half coconut flour. It needed a lot of extra liquid but the finished result was great and it didn’t crumble. 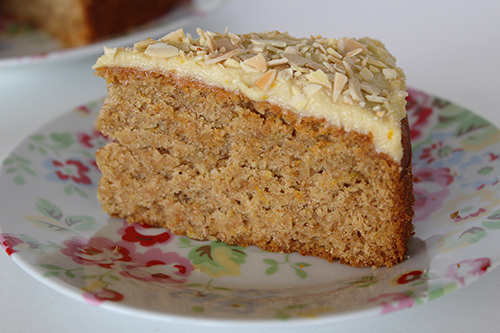 Such a great cake and one I will most-certainly be baking again! I am so pleased that you enjoyed the cake! And thank you so much for feeding back on your substitutions. It’s great to hear that the cake can also be baked using regular sugar, rather than maple syrup (which can be expensive). I love all your suggestions about new flavour and nut combinations. If you make any, be sure to report back! By the way, is the 280g amendment for the sugar quantity? If you could let me know I’ll update your comment.